Could My Child Have Hypothyroidism (and Will It Go Away)? Your kid is small for her age and tires easily. Is a sluggish thyroid to blame? An expert explains what hypothyroidism looks like in kids and how this common condition is treated. You may worry that your child is shorter than her friends and doesn’t seem to have the same energy. She’ll sit and color, for instance, rather than join in a game of tag. These concerns aren’t unusual. But taken together with symptoms like constipation, dry skin and feeling cold, they could signal a problem with the thyroid gland. This bow-tie shaped gland at the base of the neck produces hormones that are critical for kids’ physical and mental development. So when a child’s growth is slow, a sluggish thyroid gland is one possible cause a pediatrician will consider. An underactive thyroid gland doesn’t make enough hormone. The condition, called hypothyroidism, or low thyroid, may be acquired (developing between ages 2 and 18) or congenital (present at birth). The main cause of acquired hypothyroidism is Hashimoto’s thyroiditis, in which the immune system mistakenly attacks cells in the thyroid gland and weakens it. Hashimoto’s affects up to 1 in 100 children, making acquired hypothyroidism far more common than congenital hypothyroidism. Your pediatrician will take a family history, because when another family member has hypothyroidism, a child’s risk increases. 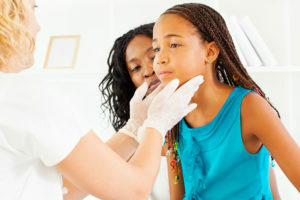 He or she will also examine your child, because an enlarged thyroid gland is another clue pointing to hypothyroidism. The pediatrician may then order a blood test to confirm or rule out a problem with the thyroid. Congenital hypothyroidism, which affects about 1 in 4,000 newborns, is considered one of the more common congenital conditions. The baby’s thyroid gland may be underdeveloped, missing or in the wrong place. Or it may not make enough thyroid hormone. In severe cases, babies can feed poorly, and have prolonged jaundice and poor muscle tone. The good news is that in the United States, congenital hypothyroidism is picked up on newborn screens, and treatment prevents babies from having these problems. Do children ever outgrow hypothyroidism? Although hypothyroidism doesn’t go away, treatment does successfully relieve symptoms. Kids with acquired or congenital hypothyroidism are treated the same way as adults: with levothyroxine (Synthroid®, Levoxyl®, Unithroid®) — a synthetic thyroid hormone that replaces the natural hormone their thyroid can’t make. Hashimoto’s usually requires lifelong treatment, although some children may need it only temporarily. Treatment for congenital hypothyroidism is lifelong. Can thyroid problems affect kids’ behavior? Since your thyroid gland helps to run your metabolism, when kids make too much or too little thyroid hormone, it can impact their activity and behavior. 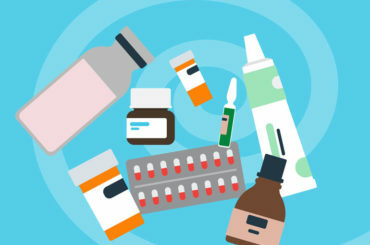 The opposite problem occurs when a child’s dose of levothyroxine is too high, or when the body makes too much thyroid hormone (hyperthyroidism). Then kids may become hyperactive and unable to sit still, with sleeping difficulties and more impulsive behavior. Thus, regular tests to check thyroid hormone levels are critical for children on levothyroxine. And you won’t have to worry about a sluggish thyroid slowing down your kid. Why Do They Prick Your Newborn Baby’s Heel?